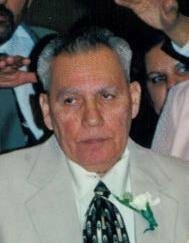 VALENTÍN - Wenceslao of West Seneca, entered into rest on September 27, 2018; beloved husband of the late Julia “Dona Julia” Valentín; devoted father of Wenceslao, Jr. (Linda) Valentín, Santos (Nancy) Valentín, Evelyn (Eric) Duvall, Edward (Odessa) Valentín, Joan Valentín (Mark Rohloff), Elena (Ronald, Sr.) Damasiewicz and the late Carmen Julia Valentín; cherished grandfather of 19 and great-grandfather of 20. Relatives and friends may visit SS Columba and Brigid Church, 75 Hickory St., Buffalo, on Sunday from 2-8 PM and, thereafter, on Monday morning from 9-10 AM. A Mass of Christian Burial will immediately follow. Interment Holy Sepulchre Cemetery. Arrangements entrusted to LOMBARDO FUNERAL HOME (Southtowns Chapel).